An artisan specialized in vegetable fiber fabrics. His relationship with fabrics began through his family, who are dedicated matara and totora weavers. At age eight he learned to knit using both fibers, and has since experimented with different kinds of fibers and knitting patterns. He is also adept at dying fibers, a technique whose learning process began with natural dyes extracted from vegetable species. Presently, he shares a workshop with his family in Lima, where he works both independently and in collaboration with them. 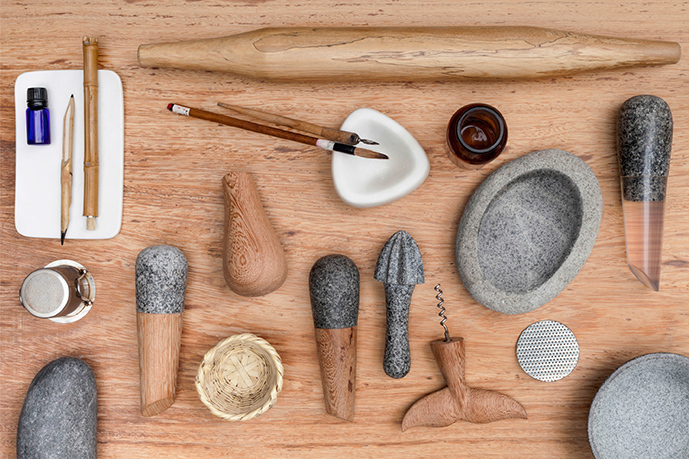 Some products made there include bags, rugs and utilitarian objects made of junco and totora. 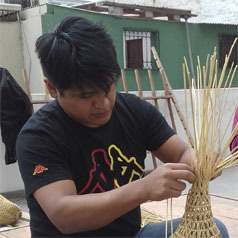 Hailing from a family with a long tradition in matara and totora weaving, Ever learned to knit at age 15, and has since experimented with fibers such as matara, totora, toquilla and junco, among others. He is versed in different knitting patterns, materials and dying techniques, but is especially dedicated to traditional junco knitting. 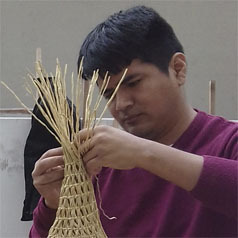 He uses this technique to produce objects such as rugs, bags and shopping baskets. He currently shares a workshop with his family in Lima, and works both independently and together with them. 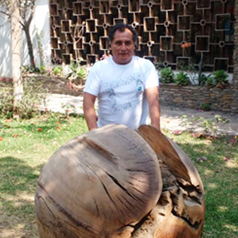 Luis Alberto Mucha Cordova followed in his family tradition of woodworking. He took technical studies in architectural drawing and civil engineering at the Metropolitano Institute, in addition to carpentry courses at the Salesiano Institute. Since 1993, he has run a carpentry workshop in Chaclacayo where he produces wood projects of any scale, from pieces for architecture to fine woodworking, the latter being his specialty. Ana Teresa Barboza (Lima, 1981) lives and works in Lima. 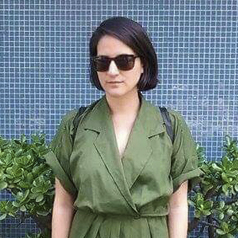 A graduate from the Pontifical Catholic University of Peru School of Arts, she has exhibited her work in individual shows in Lima and Miami, and has taken part in collective exhibitions in Lima, Mar del Plata, La Paz, New York, Houston, Barcelona, Madrid and Geneva. She has taken residencies at Fubon Artist Residency (Taipei, 2017), Utopiana (Geneva, 2015) and Cité Internationale des Arts (Paris, 2014). She won the Passport for an Artist competition in 2006, and In 2010 landed the Central Reserve Bank’s first prize. 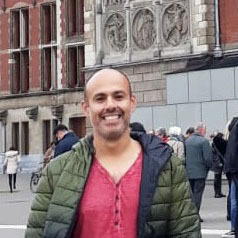 Rafael studied architecture in Ricardo Palma University. He later acquired a Master in Fine Arts in Plymouth University in England and Piet Zwart Institute in Rotterdam, Holland, developing a research on migration and mobility, by which he got the promotion prize. He worked as an architect and designer in Rotterdam and later in Rome, with Massimo Fuksas Architetto. Afterwards he worked a short period in New York and Bali with theatre director Robert Wilson. 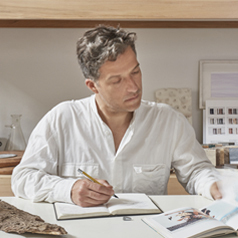 Nowadays he works as a Creative Director at Rafael Freyre Studio where he heads a team of architects, designers and artisans. Together they develop divers projects that integrates architecture, design and art. A bachelor of Professional Interior Design from the Peruvian University of Applied Sciences (UPC) in 2016. Santa María shows an affinity for designing landscapes, gardens and public spaces. Recently, she has launched her own design and decoration brand, “Hatch”. A graduate from the Federico Villareal University Faculty of Architecture and Urbanism. He had his start in rural infrastructure projects involving local materials for the experiential tourism sector. Parallel to his endeavors in architecture, he develops carpentry and furniture projects in terraces and rustic environments. Elvia was born in San Pedro de Cajas, a town close to the Junin pampa. He is son to Santiago Paucar Amaru, a renowned weaver named Great Master of Peruvian Crafts (Gran Maestro de la Artesanía Peruana) in 1993, a distinction that made the artisanal produce of San Pedro de Cajas known around the world. 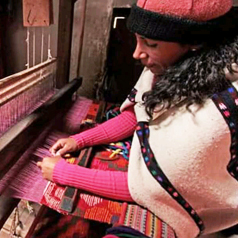 Elvia learned the loom weaving technique from his father and the art of natural dyes from his mother, Mrs. Jovita Orihuela. After Mr. Santiago’s passing, Elvia took over direction of the family workshop. Elvia takes pride in Keeping the traditional designs of her people current and exploring modern techniques, like her father did. 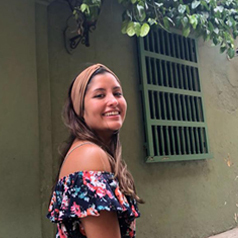 A Bachelor of Journalism from the Antonio Ruiz de Montoya University (UARM) in 2016, she has worked in print media, audiovisual media and different kinds of publishing services. She complements her work experience with studies in art, gender and historical research. A specialist in artisanal stone works. He began his specialization in 1983, working for a marble company after finishing secondary schooling. 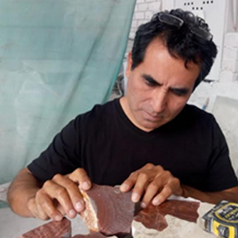 He comes from a family of dedicated stonemasons; his grandfather cut sillar blocks in Ayacucho, and his father hewed marble for a marble company in Chiclayo. Presently, he directs a team of stone workers at his workshop in Ate. An architect from the National Federico Villareal University (1970). 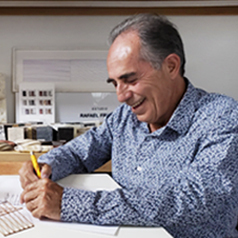 He worked with architect Daniel Arana Ríos from 1973 through 1979. He has conducted independent projects such as the La Rotonda, El Polo and El Trigal shopping malls, as well as Los Maristas Primary School. A graduate of the José María Vargas University (UJMV) School of Architecture and Plastic Arts in Caracas, Venezuela in 2005. 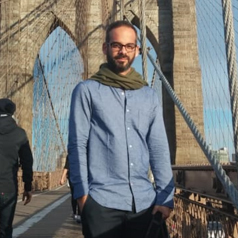 In recent years, he has complemented his professional activity with museography projects, placing special attention on the relationship between the contemporary art piece and the space through the lens of his studies in contemporary art criticism and theory. A bachelor in Architecture from the Peruvian University of Applied Sciences (UPC) in 2001. Her interest in a different scale of design brought her to fashion design. 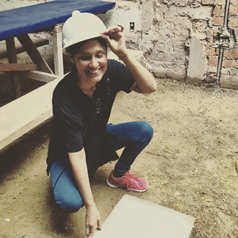 After developing original collections and managing a creative work hub for 12 years, she has currently returned to architecture through project management activities. 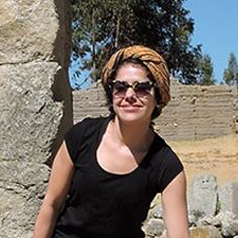 She is a climber and a development advisor for climbing garments and accessories in her free time. Licenciada en Arquitectura y Urbanismo por la Universidad Ricardo Palma (2002). Artista multidisciplinar, posee un Master en Fotografía y Arte Contemporáneo por la Universidad Politécnica de Valencia (2010) y es ex becaria del Programa de Estudios Culturales del Museo de Arte contemporáneo de Barcelona, PEI - MACBA (2012), entre otros estudios. Trabaja desde la arquitectura, el interiorismo, el diseño, la música y el arte contemporáneo en el desarrollo de proyectos pluridisciplinares. También como gestora cultural y docente en centros de arte y creación.